Pope Francis has urged global finance leaders assembled at the Davos World Economic Forum to use their vast wealth for the service for humanity, instead of leaving large portions of the world population mired in poverty and unstable living conditions. “I ask you to ensure that humanity is served by wealth and not ruled by it,” the pontiff addressed a crowd of 2,500 people in Switzerland on Tuesday. His message was read out by Cardinal Peter Turkson, president of the Pontifical Council for Peace and Justice. Pope Francis asked bankers and business leaders to stimulate inclusive prosperity. “The growth of equality demands something more than economic growth, even though it presupposes it. 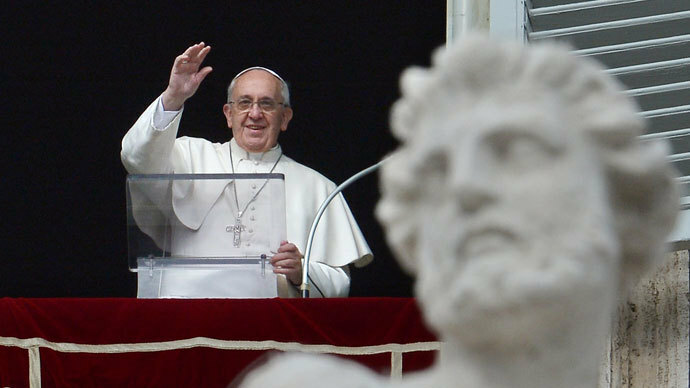 It demands first of all 'a transcendent vision of the person,” Pope Francis said in the message. “It also calls for decisions, mechanisms and processes directed to a better distribution of wealth, the creation of sources of employment and an integral promotion of the poor which goes beyond a simple welfare mentality,” he added. The comments came just one day after an Oxfam report garnered worldwide attention after showing that the world’s 85 wealthiest people have as much money as the 3.5 billion poorest people on the planet – half the Earth’s population. A total of 210 people became billionaires last year, joining the existing 1,426 billionaires with a combined net worth of US$5.4 trillion. The Argentine pope, renowned both for his harsh criticism of the excesses of capitalism and his remarkably humble lifestyle, stopped short of condemning the leaders for excesses exposed by the global financial crisis. He recognized that businesses have helped draw millions of people out of poverty. However, he also noted that a side effect of big business was broad social exclusion.